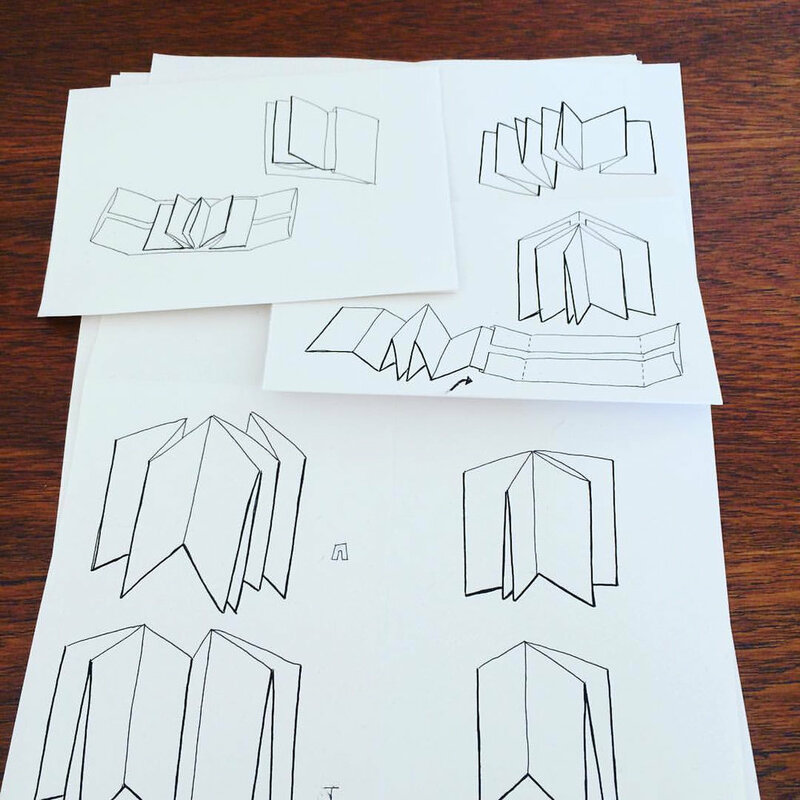 Starting work on a new book… inspired by the amazing Franklin fold in ‘The Art of the Fold’ (by Hedi Kyle and Ulla Warchol). 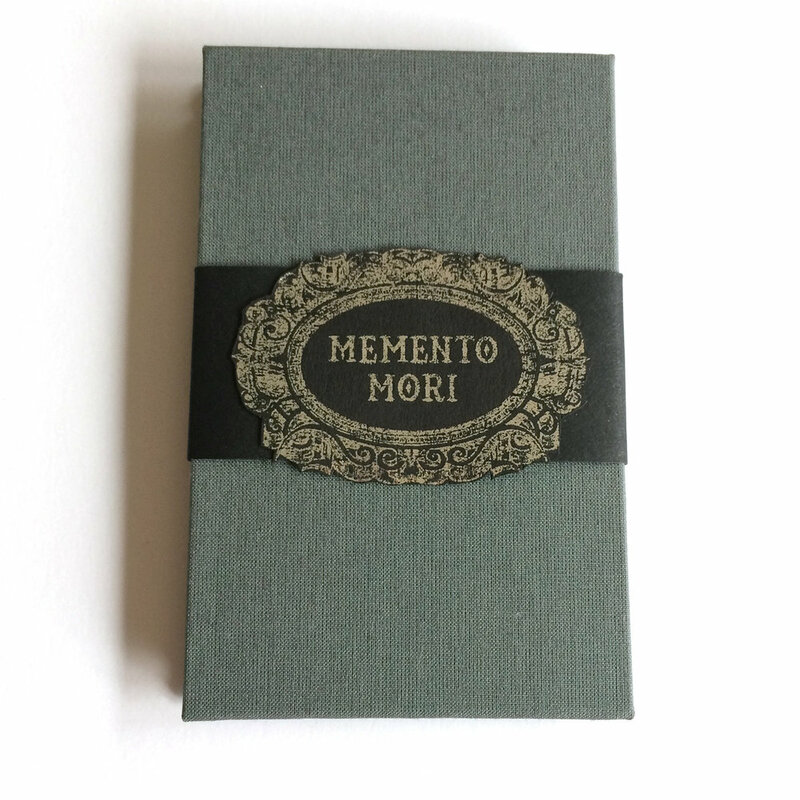 It’s a 16-page small book folded from one sheet. I’ve wanted to make something based around arrows on packaging for longer than I care to admit (it’s decades, not just years!) and this is finally it. The aim is that the book can be read in either directions - This Way Up or This Way Down depending on which way round you’re looking at it. I’ve had some flat sheets printed up onto Kraft paper to make some prototypes, and it’s shaping up well. Some minor tweaks needed, and there’s a secret fold-out section in the centre section that I’ve only just found, so room for a few more cheeky arrows. 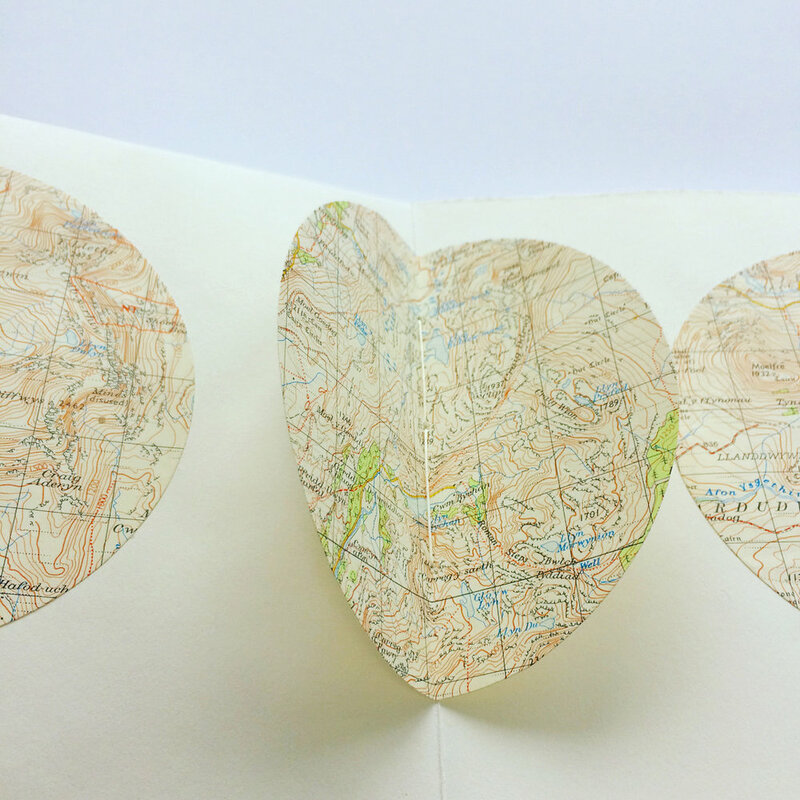 This is one of a number of new books I’m hoping to have ready for BABE (Bristol Artist’s Book Event) next Spring… date for your diary - 30/31 March 2019 at the Arnolfini in Bristol. 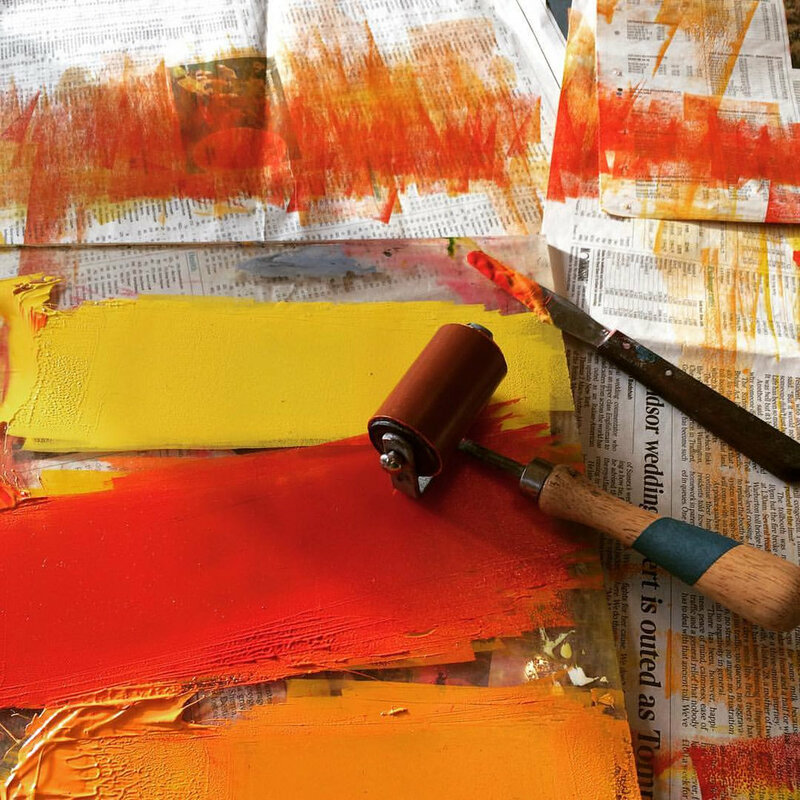 Getting inky… rollering paper for wrappers for my ‘Fiery Words’ matchbox books. With the Made in Bristol Christmas Fair coming up on 8 December, I’m in full-on production line mode, making new batches of many of my books. It’s a little chaotic at the moment, but I love that tipping point when it moves from lots of component parts to neat piles of finished books. 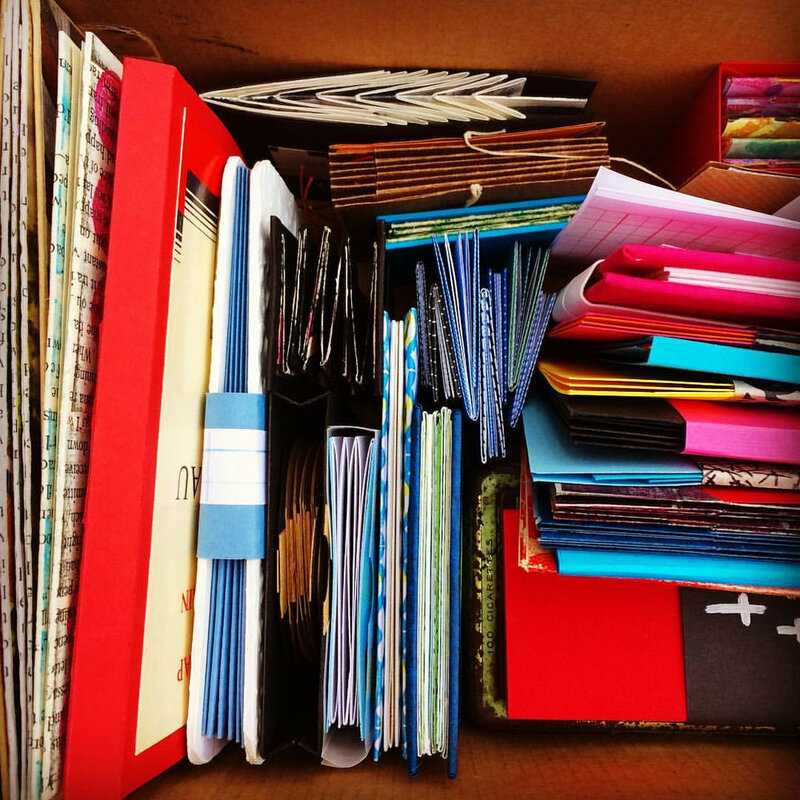 Two collections of books - the first is a box of my small books headed to the Small Publishers Fair in London earlier this month (many thanks to Sarah Bodman at UWE for chaperoning them). For the first time I went along to the fair, and spent a wonderful few hours perusing and talking about books with lots of interesting similarly biblio-minded folk. The second photo is my modest haul of new books photographed on the train table on the way home (any colour coordination is purely coincidental!) Beautiful publications by Anwyl Cooper-Willis, Daniel Lehan, Philippa Wood of Caseroom Press and Lee Shearman of Micro Library Books. Latest rubber stamp illustration in my exchange of words with Eva Hejdstrom - T is for tjuvlyssna, a Swedish word meaning eavesdropping. Really fun afternoon in mid-October running a workshop in Church Stretton in Shropshire. 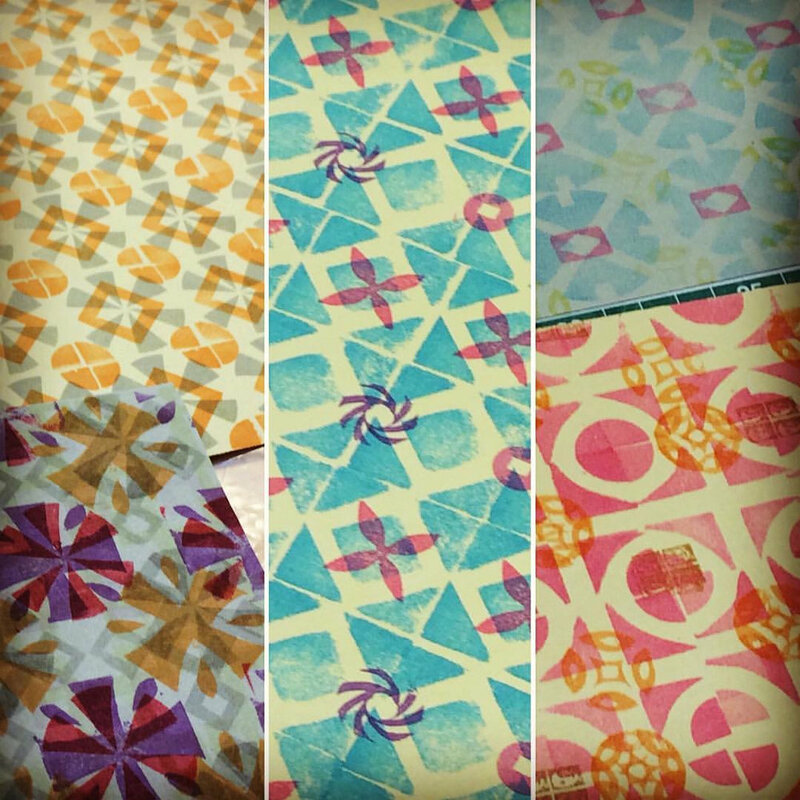 Creating patterned papers with foam blocks on sugar paper, then making two single sheet books with patterned covers. 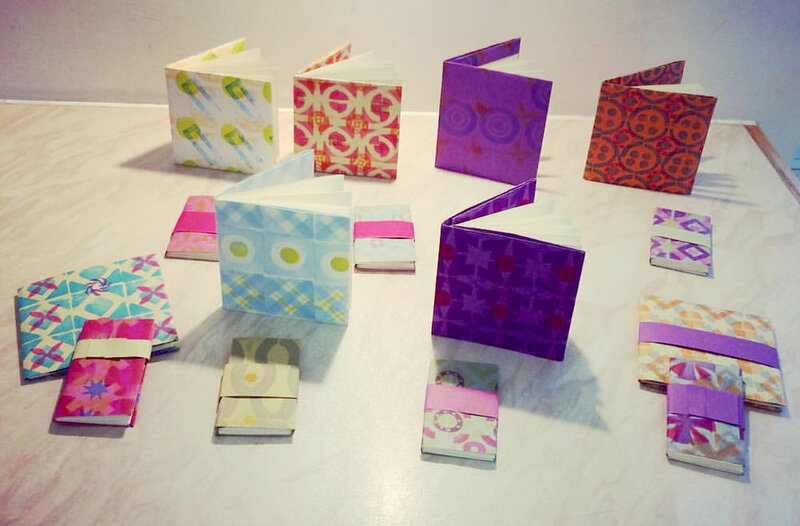 We made a snake book, and then a pocket accordion (thanks to Hedi Kyle and Ulla Warchol for their amazing book ‘The Art of the Fold’ for the instructions for a separate cover - worked a treat!) 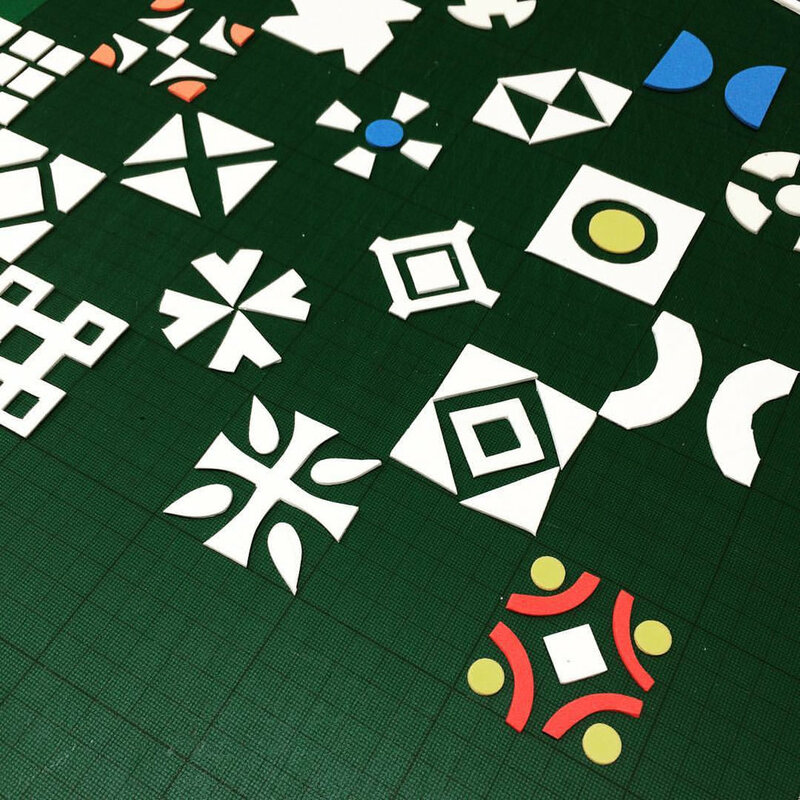 A very creative bunch, and it was really interesting to see all the different patterns that were created. Many thanks to Kate Johnson for arranging the workshop. Finally finding time to return to my collage project using paper rescued from the recycling box. 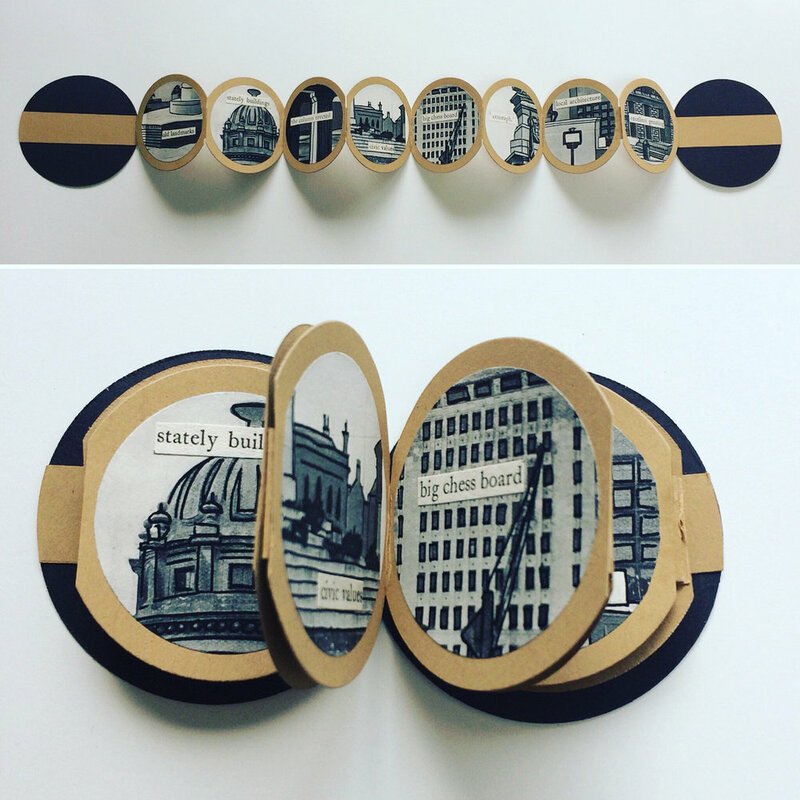 The final box of collages will form part of my submission for the ‘Found’ exhibition at UWE in December. 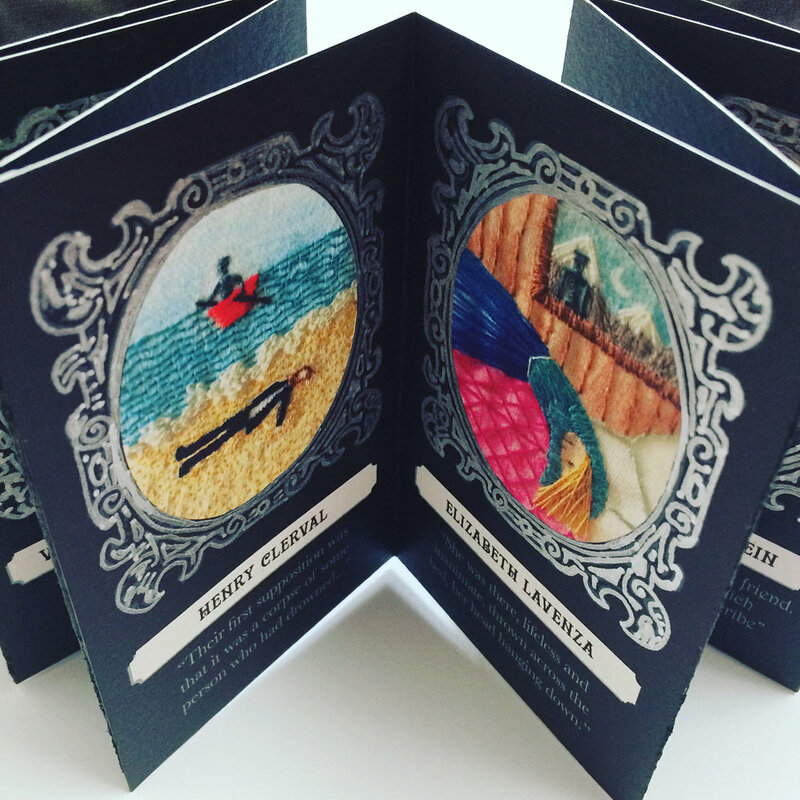 Really pleased to see my ‘Home’ pocket concertina book as part of Interruptions - an exhibition of prints and artists' books curated by Sarah Bodman and Elena Zeppou, at the invitation of the Greek Printmakers Association (E.E.X.) for Athens Print Fest “18” 4th edition – nóstos / nostalgia. It’s at the Felios Foundation in Athens, Greece, and runs from ‪3 -27 October 2018‬. If a trip to Greece is not on the cards, you can always browse a pdf exhibition catalogue here. 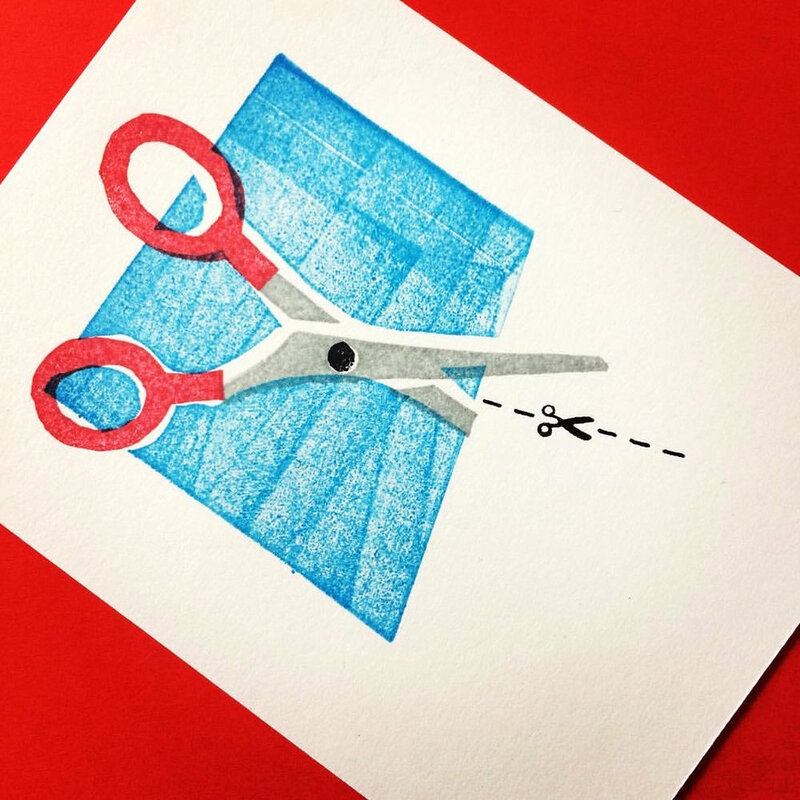 Latest rubber stamp illustration in my Anglo-Swedish ‘exchange of words’ collaboration with Eva Hejdstrom ... S is for scission - the action or state of cutting or being cut. The more I do of these, the more I like the wonkier registration, and the use of negative space seems to becoming a bit of a thing. 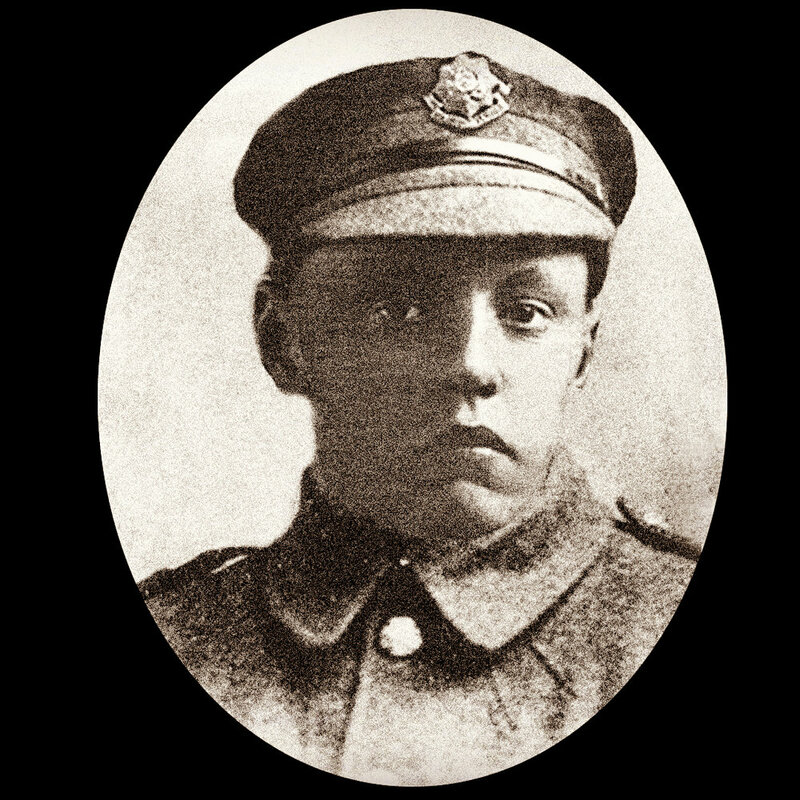 Today marks the centenary of the death of my great great uncle, killed in action in the First World War. John Douglas Robertson, known as Dougie, was born in Reedsmouth in Northumberland in 1898, and was just 19 years old when he died on a battlefield in northern France. The middle name Douglas has subsequently been carried by my granny (born just two weeks after he died), my father and my nephew. I visited his grave in 2007, and was touched by an inscription I read in the cemetery: ‘To live in hearts we leave behind is not to die’ (from a poem called Hallowed Ground by Thomas Campbell). I have been gathering material for a small book to commemorate his life... I’m starting work on it today, and I hope to complete it by Armistice Day. Gone but most definitely not forgotten. R is for 'rivning' meaning demolition in Swedish. The latest rubber stamp illustration in my 'exchange of words' collaboration with Eva Hejdstrom. 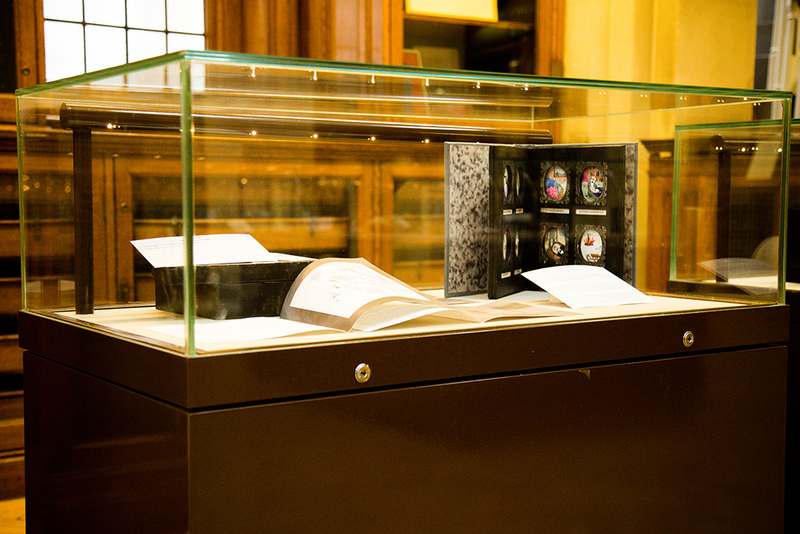 My book 'Memento mori' has been exhibited in Liverpool Central Library for the past few months (many thanks for the photos above from organiser Simon Ryder, taken by Robin Clewley). The exhibition finished this week, but will be moving to the Kirkby Gallery from 17 September - 26 January 2019. After that my book will be heading back to Bristol as the exhibition will be transferring to Bower Ashton Library at UWE. 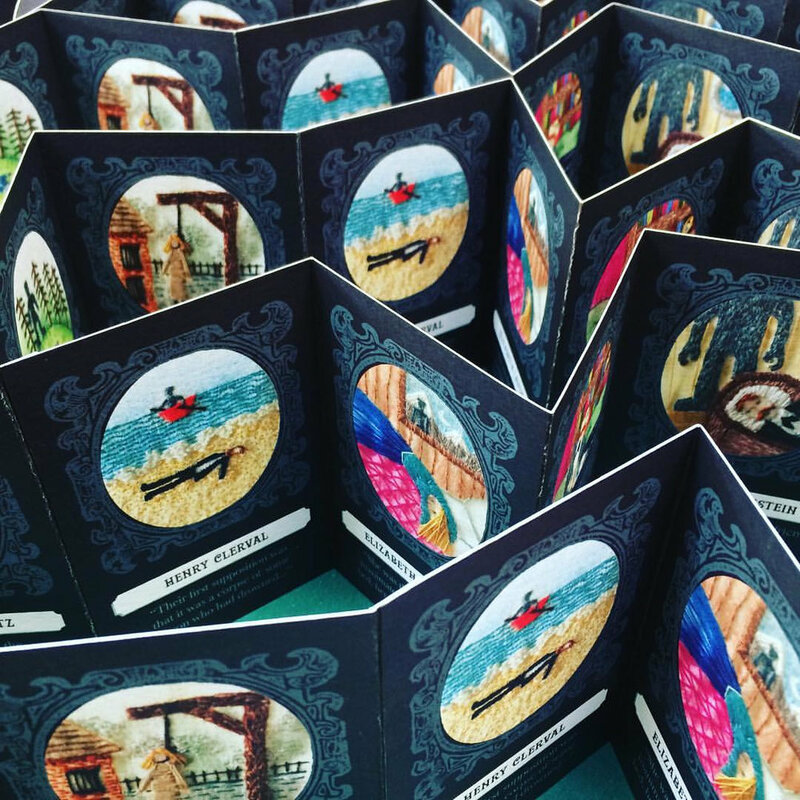 In the meantime, I'm working on a small edition of digitally printed concertina versions - the first of which is in another Frankenstein-themed exhibition in the US, at Asheville Bookworks in North Carolina which opened this week. As always, my books are more well-travelled than I am! Having finally tidied my studio a little, I came across a pile of offcuts from my Frankenstein book earlier in the year. The original book they were cut from was The Journal of the Society of Architects from the 1930s... lots of incidental crops of different buildings. 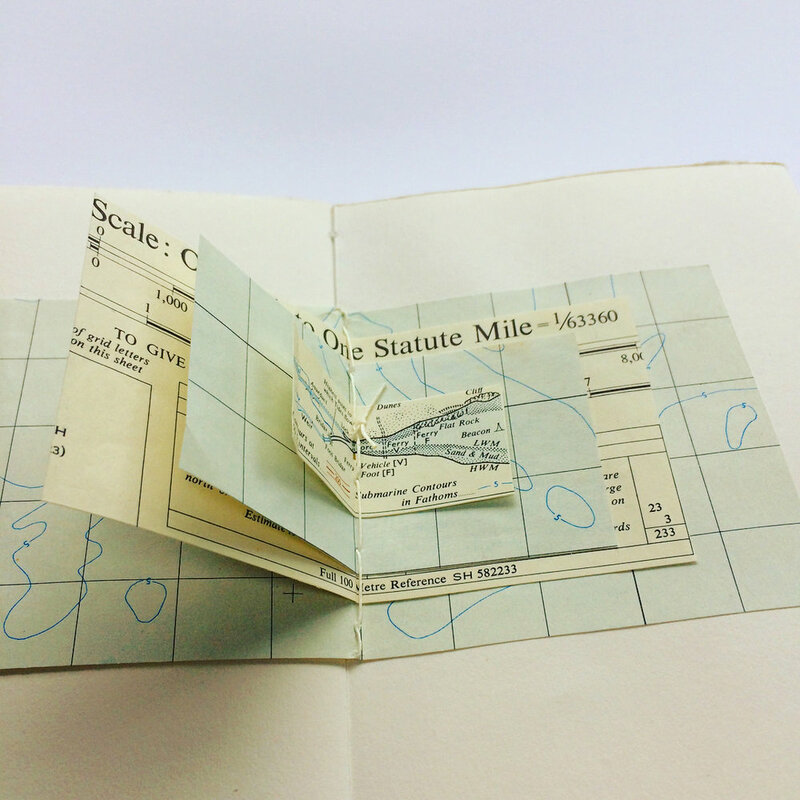 I decided to make a small one-off concertina book of these building crops with collaged text from other offcut pages. Inspired by the collage books of Daniel Lehan and the found poetry workshop by Jeremy Dixon I attended earlier this year... think this will fit the brief for ABC’s ‘Found’ book exhibition at UWE this winter. 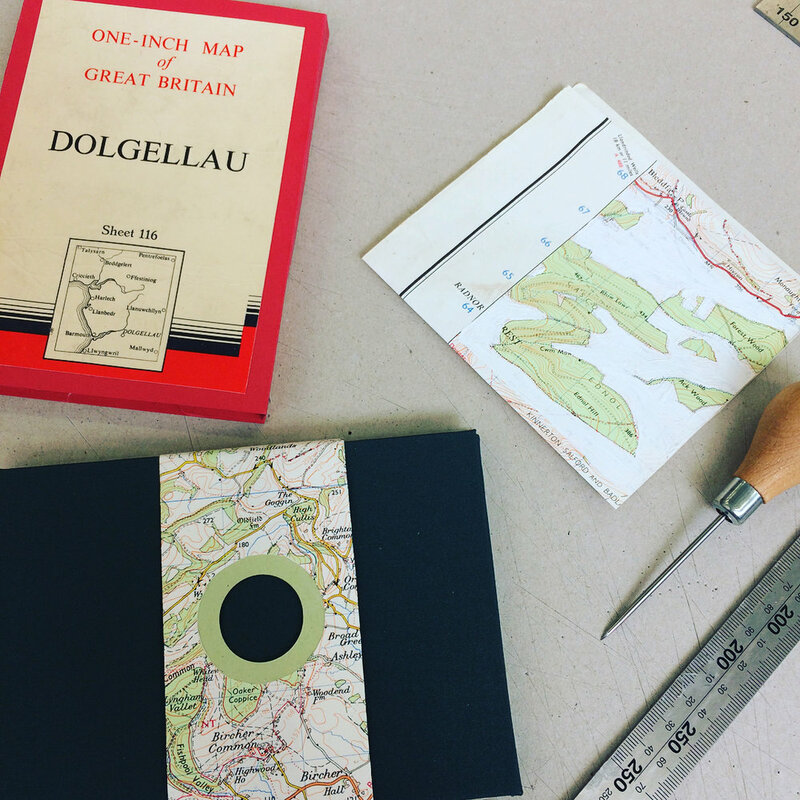 Have just spent my ideal couple of days on a book making workshop at UWE run by the inimitable Guy Begbie. 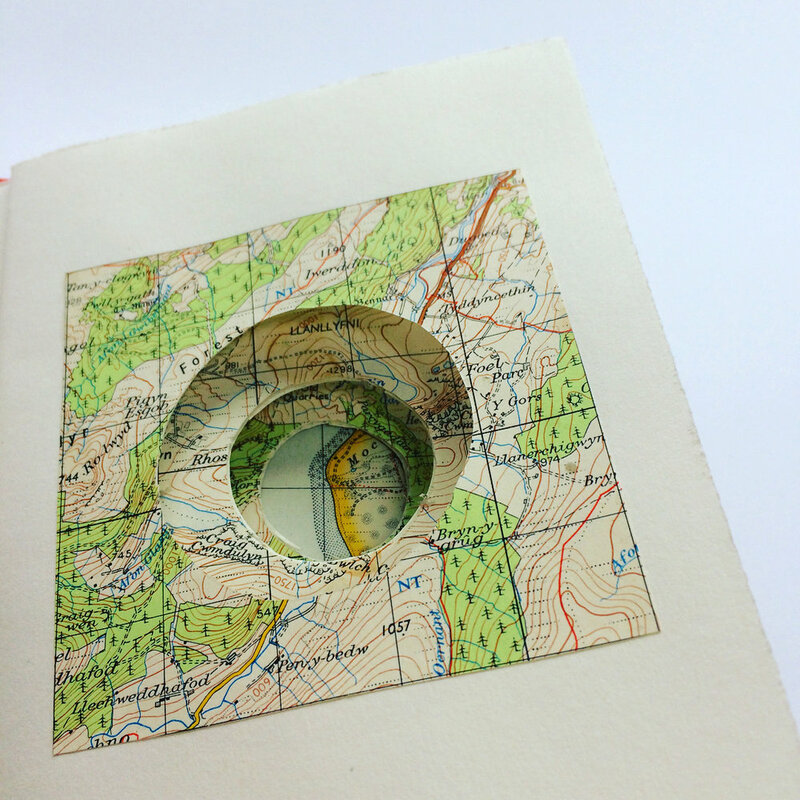 Snappily titled ‘Book Cartography: Using the Map as an Artistic Strategy Within Book Structures’ it was cutting, glueing and stitching to make books with old maps. Really enjoyable, and I’ve come away with lots of new ideas. 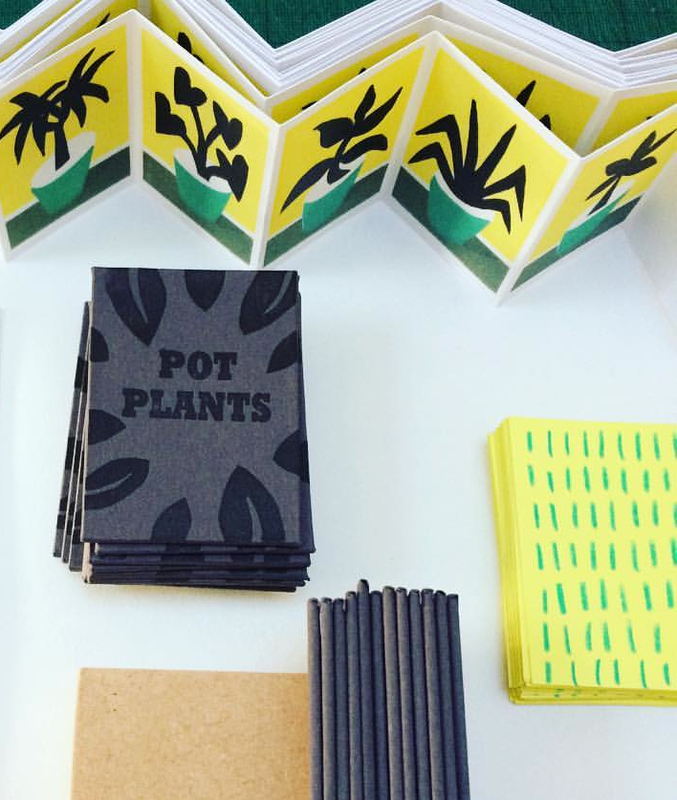 Lovely group of fellow book makers too – very inspiring to see what everyone produced. Latest rubber stamp illustration in my Exchange of Words collaboration with Eva Hejdstrôm - Q is for querist: someone who asks questions. 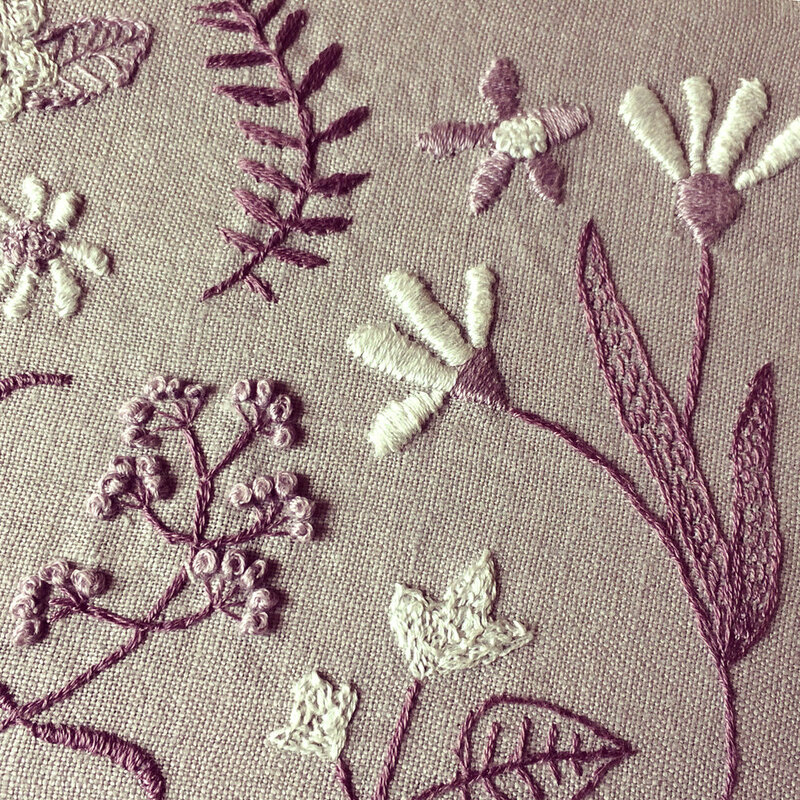 Completed just on time (as always) an embroidery for the very grand occasion of my mother-in-law’s 80th birthday in early July. 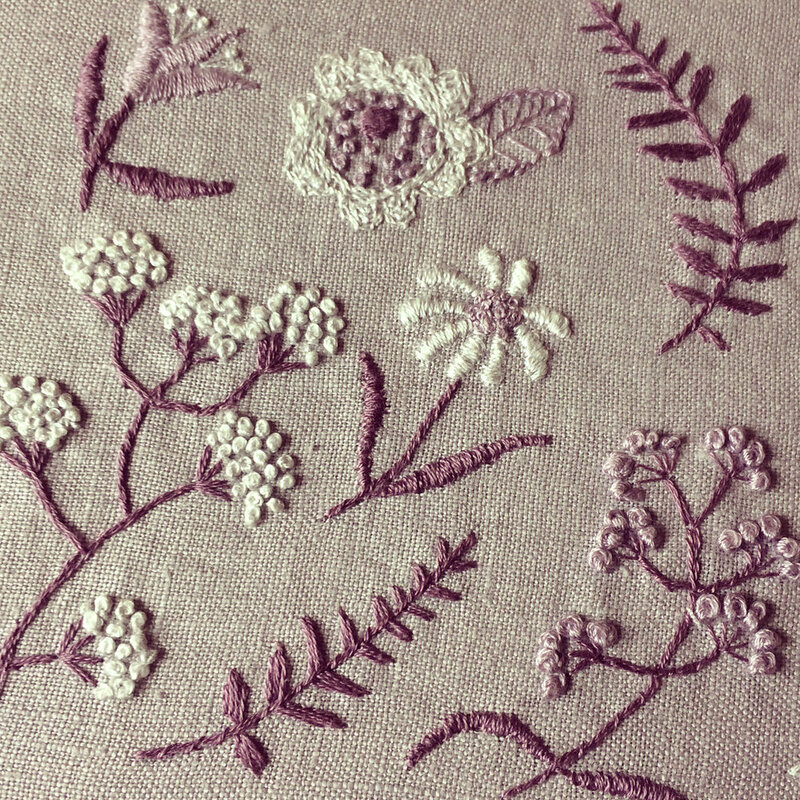 Original flower designs by Yumiko Higuchi, adapted from his excellent book ‘Zakka Embroidery’.